Osaka has a well-organized bus system. However, travelers visiting the city probably don’t need to use buses to get around, because the subway and local train system is more convenient and often cheaper and quicker too. There are some discount tickets and passes however, that include bus transport along with other forms of public transportation. 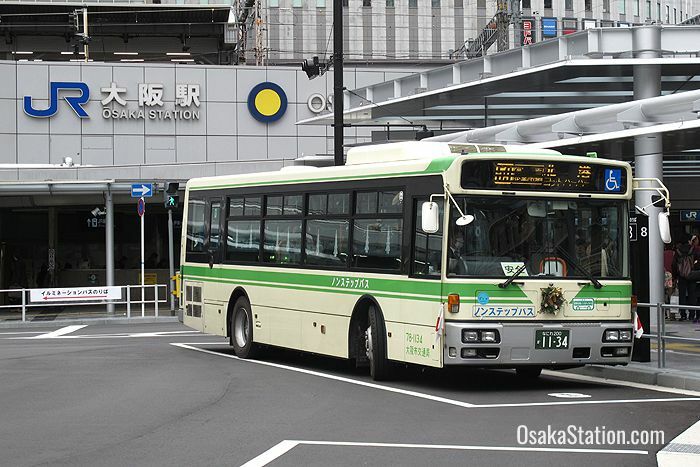 This article will explain everything you need to know about Osaka buses if you decide to use them. 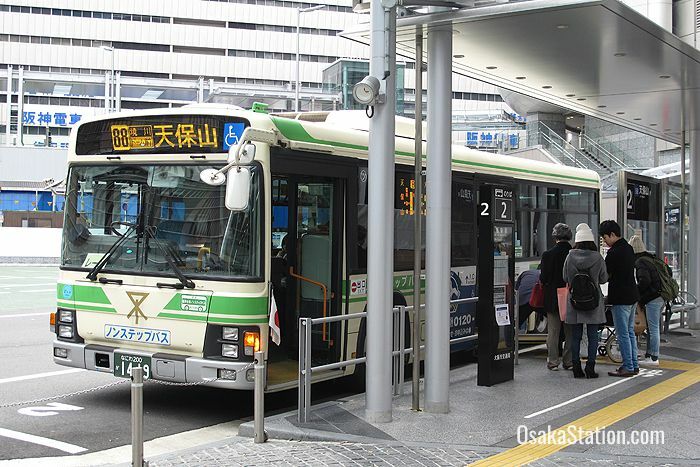 In Osaka, you should board the bus from the rear of the bus and exit from the front. When you need to get off you can push an “Alight button” near your seat and the driver will then stop at the next destination. Payment is made at the front of the bus into a machine by the driver’s seat. Payment should be made with the exact fare. If you don’t have the right coins, there is a change machine beneath the payment slot that can break down coins and 1000 yen notes. You can pay with a rechargeable IC card such as ICOCA, PITAPA or Suica. To pay with an IC card simply touch the card to the card reader beside the driver’s seat before you get off. Within Osaka City there is a flat fare zone, where adults only have to pay 210 yen and children under 12 years old pay 110 yen. Up to two infants (aged 1 – 5) can travel for free if accompanied by an adult or child. From the third infant onwards the child fare of 110 yen applies. Babies under 1 year of age can travel for free. If you want to visit Osaka Aquarium Kaiyukan at the Tempozan Harbor Village you might want to take the bus. The subway is quicker but the bus is cheaper. Take bus #88 from bus stop 2 at Osaka Station Bus Terminal. The bus will take about 45 minutes to reach Tempozan but cost only 210 yen. Traveling by subway will get you there in 20 minutes but cost 280 yen. If you wish to go to Tennoji then you can take bus #62 from bus stop #3 at Osaka Station and get off at the Abenobashi bus stop. The Abenobashi stop is very close to Tennoji Station. The bus will take 36 minutes for the same flat fee of 210 yen. This is cheaper than using the subway from nearby Higashi Umeda Station which costs 280 yen for 13 minutes. However, taking the JR Yamatoji Rapid Service is cheaper and faster at 190 yen for 16 minutes. 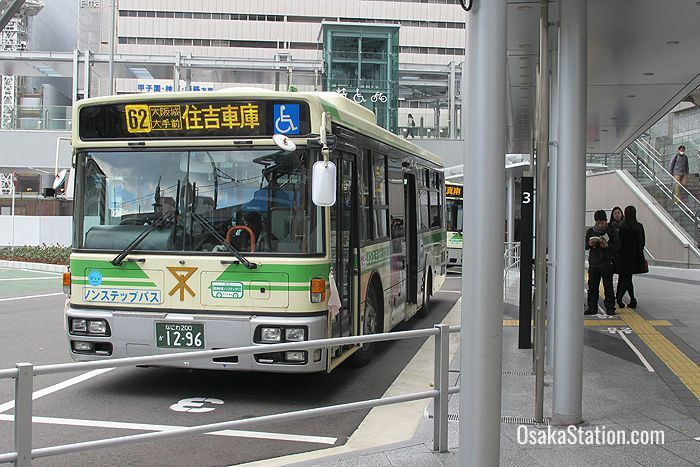 Though the bus is not the cheapest or quickest option, you might decide to use it if you have a discount pass or because the bus terminal at Osaka Station is so conveniently located. 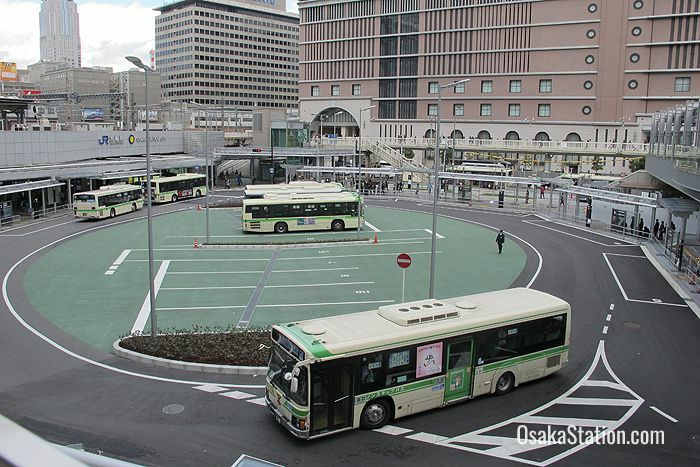 If you wish to go to Namba then you can take bus #75 from bus stop #3 at Osaka Station. This bus takes 26 minutes for the same flat fee of 210 yen. In comparison taking the subway Midosuji Line from nearby Umeda Station will get you to Namba in 9 minutes for 240 yen. You can also use the JR Osaka Loop Line and JR Yamatoji Line and get to Namba in 22 minutes for 190 yen but you will have to change trains. Again taking the bus is not the cheapest or quickest way to get to Namba but it is the easiest. There are a number of discount travel passes you can use in Osaka that include bus transport along with other forms of transportation. The Osaka Visitors Ticket (OVT) is a one day pass for overseas visitors that covers all the buses, subways, and trams in Osaka and also gives discounts at 37 sightseeing locations. The OVT costs only 550 yen but you will need to show your passport when you buy it. For details of where and how to buy it visit the Osaka Municipal Transportation Bureau website. The Osaka Amazing Pass is a one or two day pass that gives unlimited travel on buses, subways, and trams. In addition it also gives you FREE entry at 30 sightseeing locations as well as special offers at other facilities, restaurants and shops. The one day pass costs 2,300 yen and also includes the use of the private following railways in Osaka: Hankyu, Hanshin, Keihan, and Nankai. The two day pass costs 3,000 yen but does not include private railways. For more details check the official Osaka Amazing Pass website. The Kansai Thru Pass is a two or three day pass for foreign visitors that includes most private rail lines, and municipal subways and buses in the Kansai area. However, it does not include JR railways. A two day pass is 4,000 yen for adults and 2,000 yen for children. A three day pass is 5,200 yen for adults and 2,600 yen for children. For more details visit the Kansai Thru Pass website. The Yokoso! Osaka Ticket is a discount ticket for Nankai Railways which also includes Osaka’s subways, trams, and buses as well as discounts for some sightseeing locations. It is useful if you are using the Nankai Railway to travel from Kansai International Airport into Osaka. This ticket costs 1,500 yen. For details check the Yokoso! Osaka Ticket website.